Located in the Poipu Resort area on a beautiful sandy swimming beach, this popular resort is situated on 35 acres of landscaped lawns and gardens filled with tropical flowers. Great for families, golfers, and tennis buffs, this condominium resort features a "Super Pool" with water slide and several championship tennis courts. One-and two-bedroom suites offer garden or ocean views, full kitchens and large private lanais. 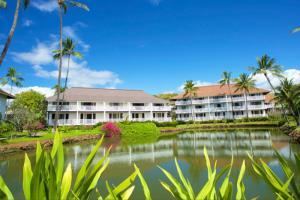 Located beachfront on Poipu Beach, across the street from the Poipu Shopping Village's variety of restaurants and shops. Waimea Canyon, Napali Coast, Kilauea Point National Wildlife Refuge, Eco Tours, Helicopter Tours, Poipu Beach Park.